Hey friends! Welcome back to my blog! I hope you are doing great! Today I am telling you about The BEST Drugstore Liquid Lipstick! You can probably already figure it out from the above picture what brand I’m talking about, but let me tell you WHY they are so great! Keep reading to find out! Loreal Infallible Pro Matte Liquid Lipsticks. Okay, so up until I found these I was happy with the high end liquid lipsticks I owned, I wasn’t really looking for a drugstore alternative. One day I was watching Jaclyn Hill on YouTube and she had a PR kit of all of these Loreal Liquid Lipsticks, the colors were beautiful and reminded me of Kat Von D’s liquid lipsticks. After watching that video, I kind of forgot about them to be honest, until my best friend ran across them and bought a few. She told me “Anna, you have to get these, they are amazing!” So that sealed the deal. I was on a mission. Needless to say, after searching around I finally found these… let me tell you all about them. The liquid lipsticks by Loreal come in a frosted plastic tube with black bold font on the outside. The applicator is a little different than others. It is more flexible, which at first I didn’t like, because it just seemed too bendable, but now I’m used to it and it works great. It has a hole in the applicator so you don’t have to keep going back from more product, just use what is on the applicator. The price will depend on where you find these, but I’ve seen them range from $7.99 – $9.99. Where to buy these… I’m still trying to find places. The only place I have actually seen them in stock is at Target. I haven’t seen them at CVS or Ulta and believe me I look for them every time. Could just be my local stores tho. 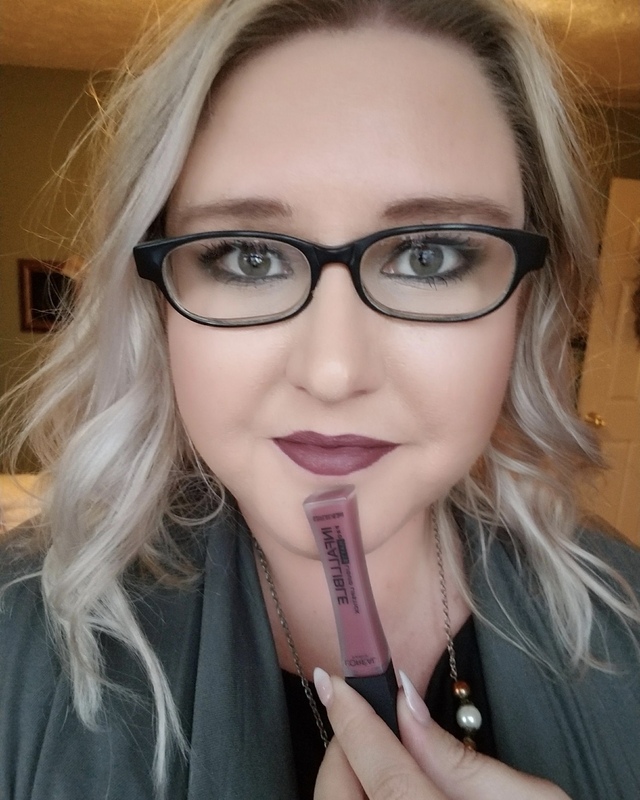 I love liquid lipsticks, so I have tried a lot of different brands and these drugstore liquid lipsticks are much better than most if not all liquid lipsticks I have tried. Here is why… Most liquid lipsticks claim to last all day, or for x amount of hours, but in my case I have found so many that actually don’t last after you’ve eaten lunch or drank a soda. Many times I’m left with nothing in the center of my lips and just a ring around my mouth like lip liner… not cute. But with these liquid lipsticks, they literally DO NOT move. I have eaten the greasiest foods ever and when I’m done by lipstick looks like I just applied it. Drink whatever you want… it’s still there. These are really comfortable on the lips. They are not drying, even after you take them off my lips still smooth and soft. A lot of liquid lipsticks I own feel like you’ve just poured cement on your lips, I get to a point in the day where I literally just want to scrub the lipstick off. They peel and feel so dry, it’s just uncomfortable. These just feel right, I’ve never wanted to scrub my lipstick off when I wear these. These are very bold rich opaque shades. The formula is smooth and doesn’t show cracks in your lips. Not to say that all high end liquid lipsticks are sheer and patchy and not opaque, because that wouldn’t be true. But for the price, the color is very smooth when applied. Left to Right: Milk & Cookies, Plum Bum, Angora (Keep in mind I didn’t let them dry all the way down because I wouldn’t have been able to get that off my hand. So it wouldn’t look shiny like that after it dries. These are absolutely amazing! Best Liquid lipstick I have ever tried from the drugstore and possibly high end as well. They last literally forever, pretty much every time I wear these I still have them on the next morning, because they are super hard to get off (could be a turn off for some). They are so smooth, so comfortable and just really pretty! I do wish they had a bigger color selection. These are so good, I want them to come out with any and every lip color I will ever need! Haha! If you are looking for a great, long lasting liquid lipstick that is affordable, you have to check these out! Do you own any of these? What are you favorite liquid lipsticks? See My Current Anti-Aging Skincare Here. Plum Bum is gorgeous! I may have to try that one.